Vintage drawing of a trestle bridge. 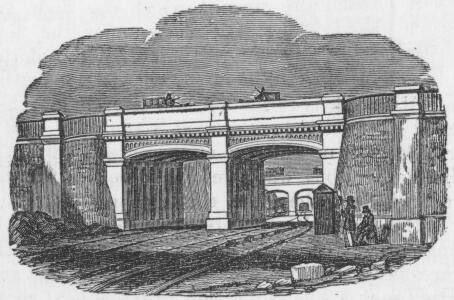 Two carriages cross the bridge which spans over several sets of train tracks. This black and white building image is copyright free and ready for downloading. I have had the pleasure of working with a number of these vintage children’s encylopedias form the 1800s. They always seem to contain such a wonderful variety of illustrations and this one was no exception. The boys’ and girls’ library containing a variety of useful and instructive reading, selected from eminent writers for youth contained the artwork of William Monkhouse (1805?-1862) and was published in 1851.